Since we’re shopping for a new stove, and one feature I find attractive is a higher output burner (particularly for stir-frying), it occurred to me to check what the heat output of my existing big burner is. My burner, on high, raised 64 fluid ounces of tap water (measured in a single large Pyrex measure) from 67°F to 130°F (by my new Taylor instant-read cooking thermometer; scale is 2 degree intervals, so the 67 is interpolated by eye) in 4 minutes (by my Casio stopwatch). I pre-heated the pan slightly, the water sizzled when I poured it in. This both accounts somewhat for the mass of the grate and the pan needing to be heated, and eliminates the need for three hands to turn on the burner, start the stopwatch, and pour in the water simultaneously. Stove burners are rated in BTUs/hour, which they usually just call “BTUs”. Reading between the lines, they’re rated by the theoretical heat production of the volume of gas they handle. Actual heat production depends on combustion efficiency. Then there’s heat transfer to the cooking vessel. Then, in my experiment, there’s heat loss to radiation, air convection, and water evaporation. I make no attempt to account for those. Reading various online articles, people seem to think heating measured the way I did it will be about 1/2 the BTU rating of the burner. The rumored 2x efficiency factor from rating to reality would mean that my burner would rate a bit under 8,000 BTUs/hr. Normal burners of modern stoves rate 8,000–12,000 BTUs/hour, so that passes sanity check. And it also suggests that a modern stove with a burner rated at 17,000 BTUs/hr would be a LOT better for stir-frying, or for cooking pasta for that matter. 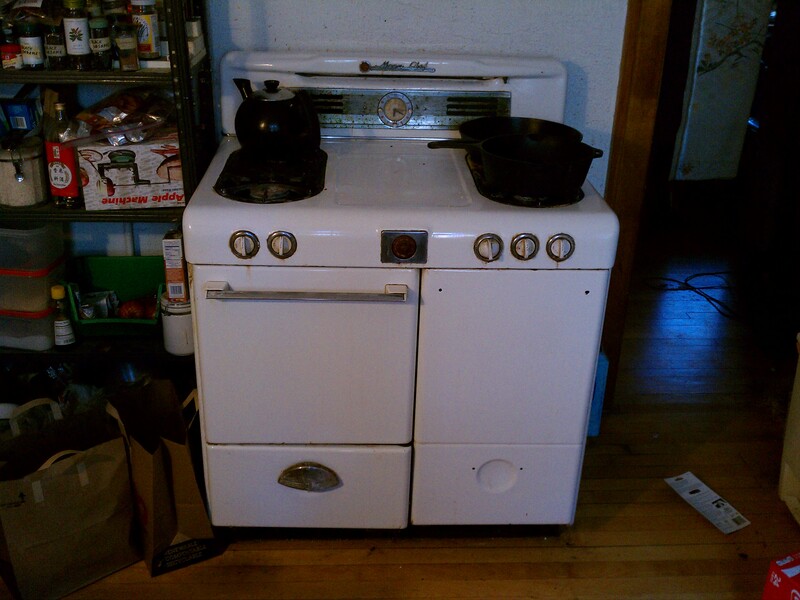 I would have felt really stupid buying a new stove with a spiffy keen high-output burner, only to discover it produced less heat than my old burner did. Also, this is yet another example of a practical math and science problem people can encounter around their home. Something you won’t meet in real life. At least, you won’t meet it except by pure luck in affordable web hosting.